The 19th century was an era of revisionism and encompassed a range of reunifications in Europe. At that time European powers expanded their influence and competed against each other in Asia while the United States started to develop its dominant position. European countries and the USA forced Imperial China and Japan to open their economies (the Treaty of Nanking, signed on August 29, 1842, ensured access to key Chinese harbors; signing the Convention of Kanagawa on March 31, 1854, the USA made Japan open its economy). Interested in China’s numerous natural resources, powerful countries began to establish their own business there and imposed unprofitable treaties on the empire. In such a way they gained Chinese territories, trade privileges, concessions and the right to receive compensations for any damage on their part, caused during uprisings against occupiers. This article aims to raise awareness of a historic clash among powers which attempted to carve out their own piece of empire and the process of shaping spheres of influence on the Korean Peninsula. Unequal treaties (不平等條約) involved not only China but also Japan and Korea. Enchanted with technological achievements, Japan, as distinct to China, accepted the dominance of powers. It started to collaborate and strengthen bonds with Western powers so as to modernize the country more dynamically. Thanks to Britain and the USA both Japanese heavy and light industry developed significantly, while Germany and France helped Japan form a strong army (in 1867 the Imperial Japanese Army was created, in 1869 – the navy known as Nippon Kaigun). In order to keep the pace of its economic growth, the Empire of Japan had to seek new ways of delivering raw materials, other than being thrown back on import. With its buoyant economy, strong army and fleet, Tokyo decided to take part in the competition for Asian territories and occupied the Korean Peninsula, which was rich in resources and used to be a Chinese protectorate before. Signing the Treaty of Ganghwa in 1876, the Japanese forced the Kingdom of Great Joseon (the Korean country) to open its economy and share its harbors. Later on, Korea signed further treaties with: the USA (1882), China (1882) and Japan (1905, 1907), which granted enormous privileges to powers. In 1895 (in fact, in 1897) the Kingdom of Great Joseon was transformed in the independent Korean Empire. In 1910 a treaty was signed, by virtue of which the Korean Empire was annexed by the Empire of Japan. Japanese governance was brutal yet it contributed to the economic growth on the peninsula. The Korean Peninsula gained independence from the Imperial China on April 17, 1895, when the Treaty of Shimonoseki was signed and ended the Sino-Japanese War. The Imperial China was obliged to recognize the independence of the Korean Empire and abandon any interest there, pay reparations totaling 7,500 tons of silver, grant the greatest trade privileges to Japan, share its harbors and relinquish control over: the Liaotung Peninsula (including the base in Port Arthur/Lüshun), the Pescadores Islands and Taiwan. Having a highly dominant position, Great Britain was granted the same trade privileges as Japan, which was extremely satisfying for the country. 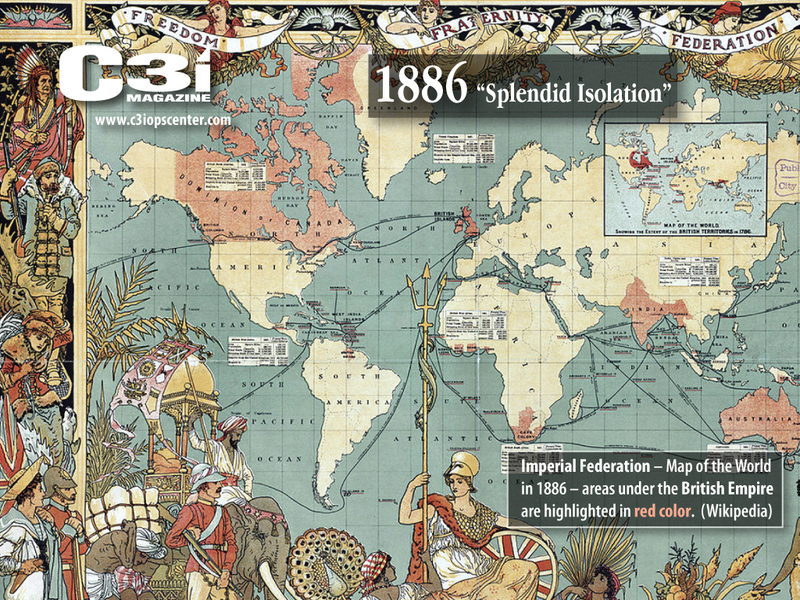 Britain’s satisfaction resulted from its splendid isolation policy pursued during the Victorian era. The policy involved avoiding entanglements in European conflicts, protecting colonies and expanding the influence of sterling. Based on industrial revolution and the development of global trade, Great Britain established Pax Britannica. British colonies delivered cheap labor, valuable resources and, first of all, potential trade areas. What they got instead was the industrial revolution. British hegemony assumed that the British control global economy and sea trade as well as set the prices of resources on global markets, and key manufactures and semi-finished products are situated in British colonies. All these factors gave them a competitive advantage over other countries. To protect its global interests, the United Kingdom pursued the two power standard. This policy ensured that Royal Navy would protect sea routes and control them in such a way that British fleet would always be two times bigger than the fleets of two other countries put together. 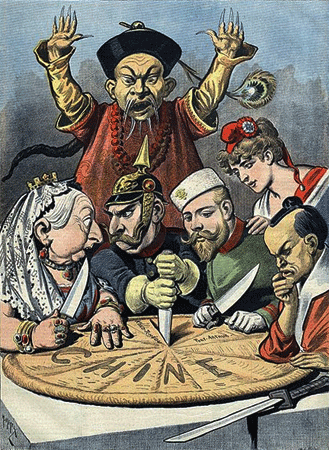 The Russian Empire strongly objected to Japanese greed as it posed threat to the Russian sphere of influence. Five days after signing the Treaty of Shimonoseki the Russian Empire, Germany and France launched a diplomatic offensive. Wary of European countries’ military power, Japan agreed to get 1,000 tons of silver and ceased to annex the Liaotung Peninsula. The Convention of retrocession of the Liaotung Peninsula, signed on November 8, 1895, confirmed the commitment. Next, European powers started to consolidate their spheres of influence in China. On June 3, 1986, the Russian Empire and the Imperial China signed a secret military alliance, namely the Li-Lobanov Treaty (stemming from the names of ministers of foreign affairs). Under the pretext of protecting China from further Japanese expansion, the Russians were allowed to build a branch line of the Trans-Siberian Railway in Manchuria (Manchukuo), access Chinese harbors, and their army could be stationed in Manchuria. The Russians were expanding their sphere of influence on the Korean Peninsula. 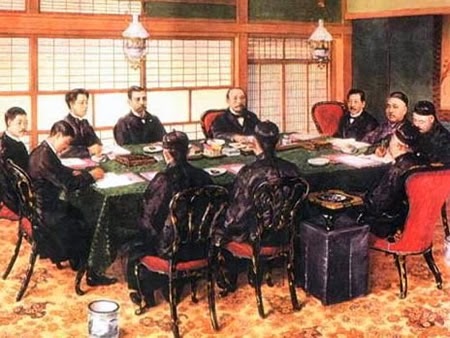 On May 14, 1896, Korean and Russian government representatives met in Seoul and signed the Komura-Weber Memorandum. Its aim was to balance Japanese influence on the Korean Peninsula. Thanks to it Emperor Gojong could escape to the Russian embassy in Seoul. Later, on June 9, 1896, Russia and Japan signed the Yamagata-Lobanov Agreement, which divided the spheres of influence on the Korean Peninsula along the latitude line of 38 degrees. By virtue of the Pavlov’s Agreement, on March 27, 1898, the Russian Empire leased the Liaotung Peninsula from the Imperial China for 25 years and got permission to extend their railway to Lüshun. The Second Convention of Peking from 1898 enabled Great Britain to lease both Weihai Harbor in the province of Shandong and the Kowloon Peninsula. On April 25, 1898, the Nishi-Rosen Agreement was signed. It stipulated stopping to interfere in the Korean Empire’s affairs. Moscow promised not to restrain Japanese investments, while Tokyo recognized the lease of the Liaotung Peninsula (the Empire of Japan perceived the peninsula and the southern Manchuria as its sphere of influence). On November 1, 1897, two German missionaries were murdered in China. German Emperor Wilhelm II used this fact as a pretext to invade a part of the southern coast of the Shandong Peninsula. German troops were sent there immediately and occupied the peninsula without firing a shot. In 1989 Chinese government agreed to lease Jiaozhou for 99 years. Rich in resources (vast deposits of coal and iron, enormous forests), Manchuria was the most important region for Russia considering the realization of its Far Eastern policy. Manchuria would cut the Korean Peninsula off from the land and, as a consequence, the Russians would dominate the region. It would also enable them to enter China using its geographical position (the western part of China is predominantly mountainous, the northern – covered with deserts, while the eastern one, Manchuria, forms a bridge opening the Manchurian Plain). Controlling Mongolia, the Russian Empire ringed China. The control over Manchuria could enable Russia to get to the Pacific Ocean through the Yellow Sea (from where they could send their fleet to Beijing). The Russian Empire controlled Manchuria when its army, comprised of 170,000 soldiers, helped to suppress the Boxer Rebellion in 1900. Powers which run business in the Imperial China got worried because of that. Pulling out troops started in 1903 and was continued in three steps, each of them lasted six months. On January 30, 1902, the first military alliance based on equal rights was signed between a Western country (the British Empire) and a non-western one (the Empire of Japan). The alliance was anti-Russian in its character. Japan felt safer and could pursue stronger policy against Russia although the document did not oblige Great Britain to declare a war against Russia. 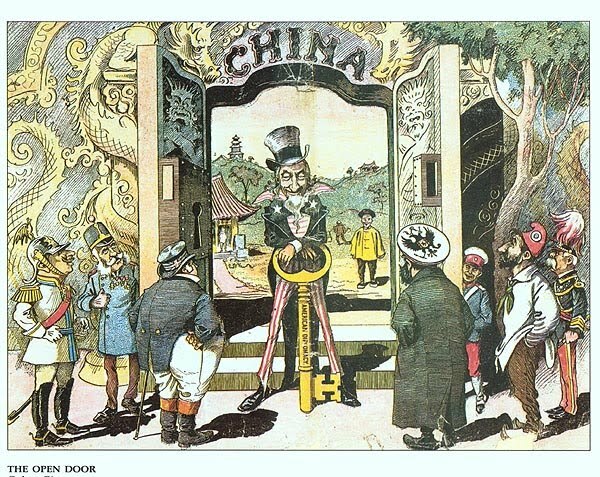 At the beginning of 1902 the United States announced that the Russian Empire did not have a monopoly on running business in Manchuria and it violated the US Open Door Policy (click here to find out more) towards China. The announcement resulted from concern about the Russian Empire’s growing influence in Asia and China, which posed threat to American policy towards China. The Japanese rejected all attempts of the Russians to negotiate the sphere of influence in Manchuria, including the proposal to give up their interest in the Korean Peninsula in favor of gaining Manchuria. Japan offered to recognize Russia’s special interests regarding railway investments in Manchuria providing that Russia respected the Open Door Policy in China. To gain the acceptance of Russian position in Manchuria, Moscow would have had to resign from forest concessions in the northern Korea. The Japanese were ready to accept the situation when both parts would respect their interests in Manchuria and Korea. On February 6, 1904, Japan severed diplomatic relations with Russia and invaded Port Arthur on February 8, 1904. Over the next months, Japanese troops surprised the world driving the Russians out of Korea, invading Manchuria and occupying the Liaotung Peninsula. Peace negotiations were initiated after their win over the Baltic Fleet, which came to help Russia despite using a circuitous route (the British denied access to the Suez Canal). In the meantime, on July 27, 1905, Japan and the USA signed the secret Taft–Katsura Agreement. It stipulated that the USA recognized Korea as a sphere of Japanese influence and Japan recognized Philippines as a sphere of American influence. As Frederick Arthur McKenzie wrote in his „Korea’s Fight for Freedom”, the Koreans believed that the USA broke their promises given in the Shufeldt Treaty from 1882 and perceived it as an act of betrayal in favor of Japan. On August 23, 1905, the Treaty of Portsmouth ended the war. The Russian Empire relinquished its rights to control Manchuria, Port Arthur, Dalian and the southern part of Sakhalin and gave them to Japan. 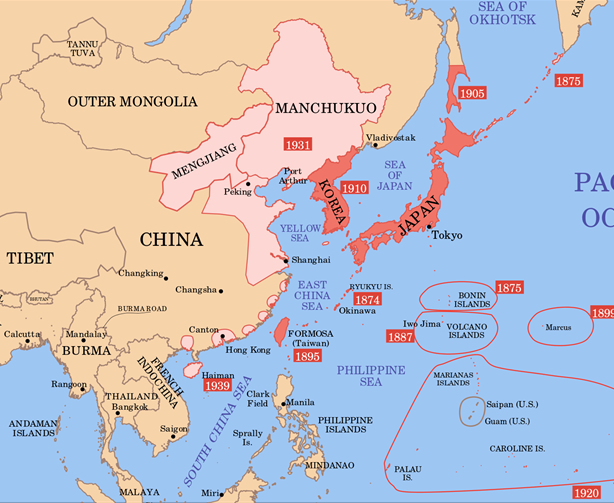 The vast territory of Manchuria was demilitarized, and the Korean Peninsula became a protectorate of the Empire of Japan (in 1910 Japan annexed the Korean Peninsula). Since then, Japan won international prestige and respect, and was perceived as an economic and military power. As the USA observed Japan’s expansion in China and its growing military position, the country wanted to stop the Japanese from emigrating to the US and maintain its influence on the Pacific Ocean. To ensure the balance of powers on the Pacific Ocean and press Japan, the USA made use of Big Stick ideology and sent its fleet there. 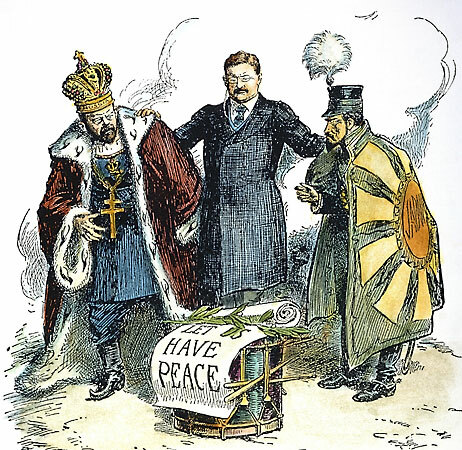 On November 30, 1908, the Root–Takahira Agreement was signed. Both countries agreed to respect their economic interests and collaborate on providing safety for sea routes yet not to express the willingness to dominate the Pacific Ocean. On the one hand, Japan had to recognize the American annexation of Hawaii and Philippines, which was the consequence of the Philippine–American War and the Philippine Organic Act approved by the Senate in 1902. On the other hand, the USA recognized territories controlled by Japan after the Russo-Japanese War. Furthermore, the Americans forced Japan to pursue the Open Door Policy in Manchuria. The Korean Peninsula is a “highway” of conquests and that is why it always plays the crucial role of a buffer in strategies followed by the most powerful countries. The Korean unification would not be preferred neither by Russia nor China (North Korea serves them as a buffer protecting them from the USA) nor Japan (a new power would emerge in the region). However, the Korean unification would enable the USA to remarkably expand the influence on Asian countries. This article was translated by Studenckie Biuro Tłumaczeń Uniwersytetu Jagiellońskiego.